Books of condolences are being opened at Bulgarian diplomatic missions in Europe and America after the death of Bulgarian Orthodox Church head Patriarch Maxim, who died on November 6 2012 at the age of 98. In the first hours after Maxim died, a black ribbon flag of mourning was draped on the landmark Alexander Nevsky cathedral in the capital city Sofia and a queue rapidly formed for the book of condolences opened at the nearby headquarters of the Holy Synod, the Bulgarian Orthodox Church’s governing body. The Cabinet was expected to decide at a scheduled meeting on November 7 on declaring a period of national mourning. Clarity was expected on whether this would be a day or longer. Already, on November 6, official mourning was declared in Troyan, the town near the village when Maxim was born. Bulgarian-language media said that Maxim would be buried at Troyan Monastery on November 9. 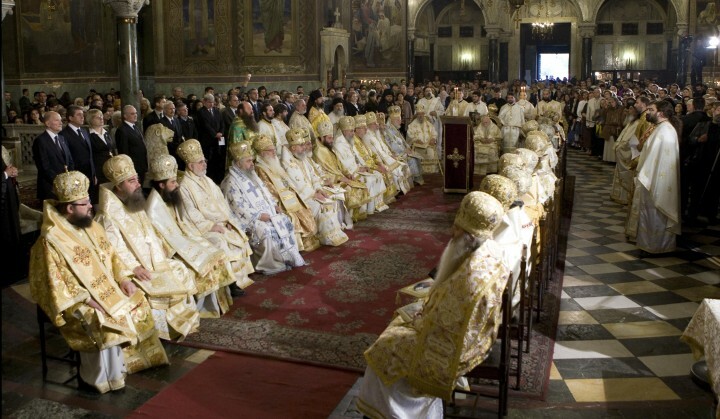 A requiem liturgy would be held on November 8 at the Sveta Nedelya church in Sofia, at which the body of Maxim would lie in state, reports quoting the Holy Synod office said. A funeral service is scheduled for Alexander Nevsky cathedral for the morning of November 9, at which the public would be able to pay their last respects to Maxim, reports said. President Rossen Plevneliev sent condolences on November 6 to Metropolitian Grigorii, acting head of the Holy Synod, and to bereaved Orthodox Christians, the President’s office said. “Today God gathered to himself the pastor of Orthodox Christian Bulgarians, who dedicated his life to the wellbeing of the Bulgarian Orthodox Church and the spiritual upliftment of our people,” Plevneliev said in his letter to the Synod. Throughout the years marked by storms and temptations, Patriarch Maxim had shown his determination, and had worked, for the unity of the church and the strengthening of Christian values and virtues in Bulgarian society, the President said. “In his service to God and the Church, Patriarch Maxim was always and invariably guided by a deep faith and love for humankind, by piety and wisdom,” Plevneliev said. Bulgarian Prime Minister Boiko Borissov said that Maxim had dedicated his entire life to Orthodoxy and the preservation and strengthening of spirituality in tumultuous years of the transition between two millenniums. “Due to his dedicated work as spiritual leader and head of the Bulgarian Orthodox Church, Patriarch Maxim enjoyed the trust and love of the Bulgarian people,” Borissov said. “He worked tirelessly for the good and beneficial relations between the Bulgarian Orthodox Church and state,” the Prime Minister said. Borissov said that history would remember Maxim as one of the heads of the Bulgarian Orthodox Church with principles and vision. This meant that Maxim’s death was a huge loss, not only to the Orthodox Christian Church, but also to the Bulgarian people and state, Borissov said.